Feed point impedance at resonance is very high 5700Ω, and being a high Q antenna, they are very sensitive to dimensions, nearby clutter etc. 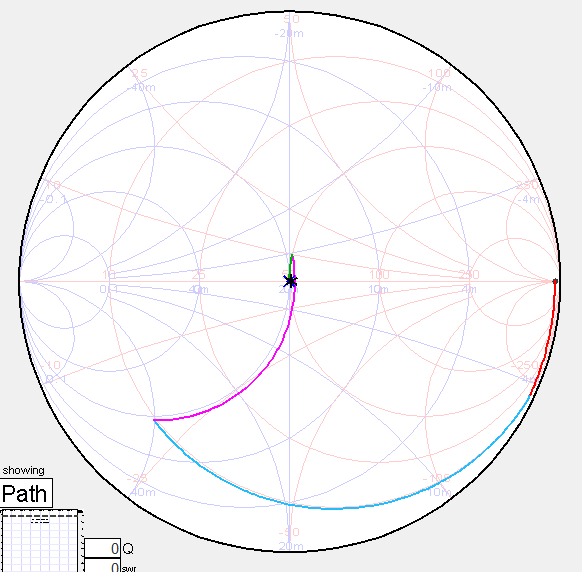 Note that this is calculated for an antenna in the clear, it will be different where trees or conductive mast exist nearby. Above is a diagram of one of several feed arrangements from the ARRL. The classic ham design would be to transform 50 to 5700 we need a turns ratio of (50/5700)^0.5=0.093, so you would design an inductor to resonate with an available capacitor and tap it at 9.3%. Of course this method cannot deal with a reactive load and pretends the transformer does not contribute significant reactance. Well, that back of the envelope design will not work exactly for an air cored solenoid at RF because of the practical flux leakag (though sometimes it might be close), designing coupled coils (for that is what we have) is more complicated than that. 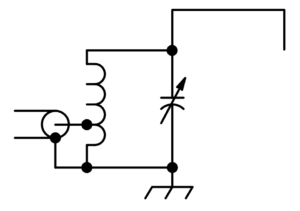 Solution 1 uses a tapped inductor and variable capacitor as in the schematic. The inductor is an air solenoid of 28t of diameter 52mm and pitch 5mm, tapped at 3.5t. These calcs assume a low loss capacitor because of the very high load impedance. The capacitor needs to be at least 200pF, and more importantly, at 1500W it needs to withstand 5kVpk… a vacuum variable is the obvious choice and has advantages for outdoor deployment. But vacuum variables are quite expensive! 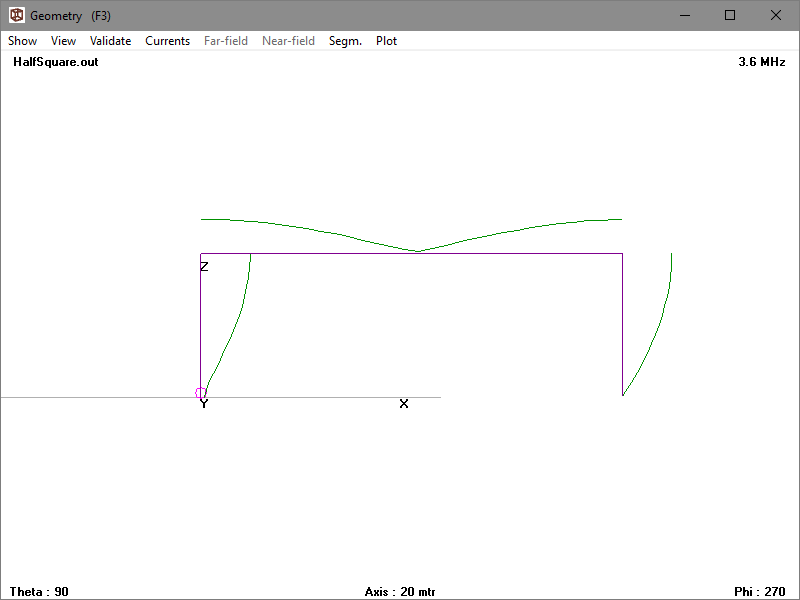 Solution 2 uses a mid Q (200) tapped inductor and fixed capacitor, and is tuned / matched by adjusting a tap on the top of the coil and one nearer the bottom of the coil. The inductor is an air solenoid of 30t of diameter 52mm and pitch 5mm, antenna tapped at about 22.3t and feed tapped at 2.8t. 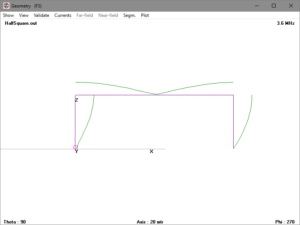 These calcs assume a low loss capacitor because of the very high load impedance. The capacitor used is 200pF, and more importantly, at 1500W it needs to withstand 5kVpk.. a vacuum fixed capacitor is the obvious choice and has advantages for outdoor deployment. These can still be bought on eBay out of Russia for less than $40 inc shipping. Above is a Smith chart model of match (from SimSmith). 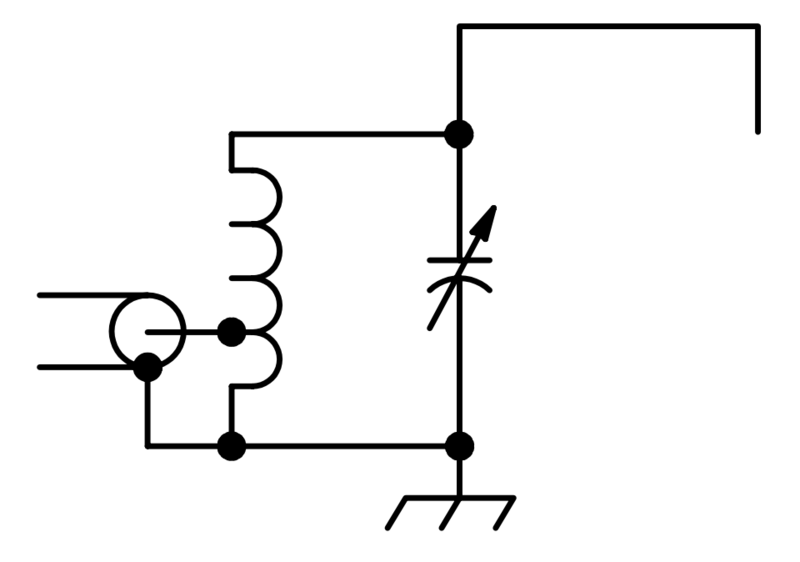 The three L elements are inextricably linked and cannot be individually varied as they form an equivalent circuit for the autotransformer / inductor. The inductor Q values come from distribution of the total coil resistance over the parts, and the mutual inductance components are lossless. The -1GQ is to force a near lossless inductance, and a quirk of SimSmith’s unconventional meaning of Q is that it needs to be negative in this case. 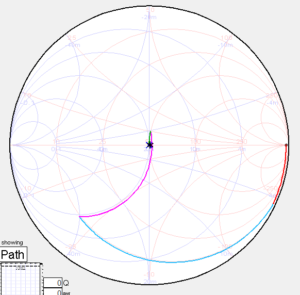 Above is the Smith chart plot of the match. Lots of ham articles show matches of this type without the shunt capacitance (the red element on the Smith chart) but the capacitance is essential to its operation. In the case of antennas (particularly VHF) that seem to work without it, it is inherent in the mount for the radiator. Increasing Q of the tapped inductor reduces losses. Winding the inductor with 2mm copper should raise Q for the whole inductor to around 500. The inductor is an air solenoid of 30t of diameter 52mm and pitch 5mm, antenna tapped at about 22.3t and feed tapped at 2.8t. These calcs assume a low loss capacitor because of the very high load impedance. The capacitor used is 200pF, and more importantly, at 1500W it needs to withstand 5kVpk.. a vacuum fixed capacitor is the obvious choice and has advantages for outdoor deployment. The model above uses the higher Q inductor and the losses are reduced by about 0.3dB, about 7% improvement in radiation efficiency. Note that the turns are space to reduce proximity effect driving higher coil loss. For a practical deployment, I will tune this initially with an analyser using a silvered mica capacitor to confirm the design, and then based on that experience, buy a vacuum capacitor that will be compatible. Fixed capacitance choices range from transmission line sections to doorknob capacitors. both are much lower Q than a vacuum capacitor, you need to do calcs and assess whether the loss is acceptable. Variable capacitors can be mid range Q, but long term weather resistance may be an issue.